Fall Rice Bowl. I am loving that fall is here. Cooler air and all the yummy fall produce! Squash is my favorite seasonal vegetable. It went so well in this healthy vegan Rice Bowl. Then again, squash goes so well in just about anything! Sweet or savory. I used butternut squash, but I also think kabocha squash would work nicely. If you don’t eat rice, this can also be made with quinoa. I chose wild rice because I think the earthy flavor goes so well with the squash. I think kale or even mushrooms might be other nice additions. The perfect bowl for Fall! Peel the squash, remove the seeds and cut into cubes. Place the squash on a lined baking sheet and brush with a little oil. Roast for about 35-40 minutes. While the squash is roasting, saute the onions on medium heat, in a little bit of oil. Cook just until they start to soften a little. About 5 minutes. Once the onions are done cooking, add them to a bowl with the remaining ingredients and mix well. This should last about a week in the fridge. I am not sure if it can be frozen, if you try, let me know the results! Holy yum! Im into anything squash so this needs to be in my life asap ! Thanks Heather. Yours sounds yummy too! Thanks for sharing. This recipe looks great! Can't wait to try it. 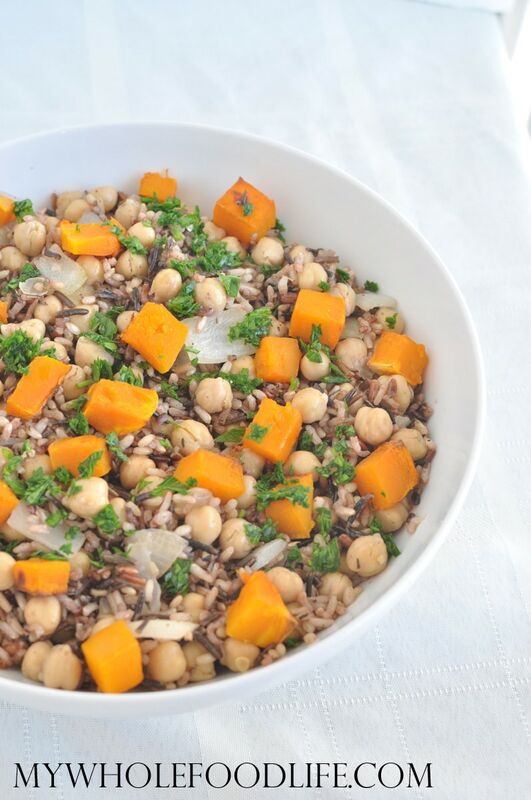 I've never combined wild rice with chickpeas and butternut squash before, but I love eating brown rice with butternut squash and tahini sauce. You're welcome! I hope you enjoy it .